Want to treat your sweetie, your children, or yourself for Valentine's?? Sugar Cookie Bars are the way! I've seen this recipe floating around pinterest, and many blogs for years, and I have always wanted to try them. 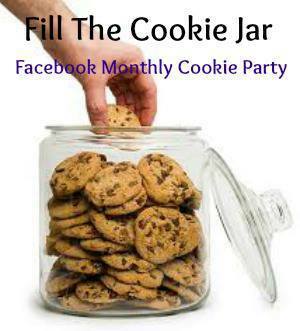 So, just in time for Fill the Cookie Jar's February edition, I made a batch, and I am so glad I did! 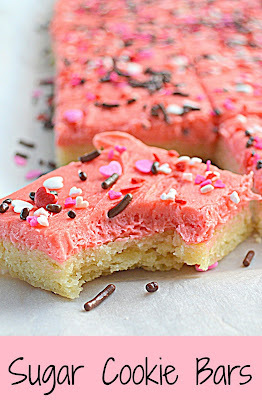 Sometime's this recipe is called Lofthouse Sugar Cookie Bars. I didn't even know what that meant until I googled it. Apparently, Lofthouse is a brand of packaged cookies you would buy at the store. Am I the only one that didn't know this? I will have to watch for them, just so I can taste one. This recipe has been featured on so many blogs, so I was curious where it orignated, and while I can't say for sure, I followed it all the way back to 2010 at Today's Mama. But, these bars... Oh my gosh. Ridiculously Delicious. Soft. Chewy. Darn near perfect in my opinion. The frosting I used, was a bit to sweet for me, but got really high marks from everyone else. Preheat oven to 350 degrees. Line 15 x 10 baking sheet with parchment paper, set aside. In large mixing bowl, cream butter, cream cheese, sugar and mix well. Add egg, and continue mixing for about four minutes. Add vanilla, and mix until well combined. In small bowl, combine flour, baking powder, and baking soda. Gradually add dry ingredients to butter mixture. Mix until flour is completely incorporated. Press dough into prepared pan. Bake for 20 minutes, just until edges are a very light golden. While Sugar Cookie Bars are cooling, beat butter in large mixing bowl until smooth. Gradually add powdered sugar. Blend in vanilla and salt. Add milk as needed to reach spreading consistency. YUMMMMM! These have been on my must try list for a while now too, but I just haven't got to them yet. I know I will love them when I do. And now I know exactly which recipe I am going to try. Thanks for narrowing it down for me. I'll pin this and make sure to try them soon! It took me a little time, but I'm back. I'm making these today! Facebook memories had me thinking about making them this weekend too! oh, hello, buttery frosting cookie squares! so festive and fun (and DELICIOUS). They look so inviting with that pinky buttery frosting! I will be making these up for next weekend. Thank You! Hi Kris, These 'Lofthouse' cookie bars look so yummy, and I like the use of cream cheese which always makes a cookie twice as good. This is a cookie I know the kids will love. These looks delicious and adorable! What a sweet treat and inspiration you shared with us!!! Oh how I wish I had a stack of these luscious treats in front of me right now. Thanks so much for sharing with us at Weekend Potluck. These would be perfect for Valentine's Day for sure. I go to meetings where I bring treats. These will be perfect! Thanks. Pretty! And making bars goes a little quicker than making cookies, so that's a plus, too, on busy days.